With the millinginator, NG Green Innovations GmbH. from Kirchberg a.d. Pielach (Lower Austria) is literally catapulting a proven technology into the 21st century. Already in the first practical tests with snow, wood chips, etc., the multifunctional tiller surprised with unprecedented energy efficiency and performance thanks to a newly designed blower wheel. The astounding functional principle of the milling machine was professionally supported in a multi-body simulation by independent experts from Linz Center of Mechatronics GmbH (LCM). NG Green is currently working at full speed to complete the first presentation models. The interest of potential customers is already enormous. “Our goal was to develop a milling machine that meets modern energy efficiency requirements while at the same time reaching a completely new level of performance,” recalls Leopold Gansch, founder of NG Green. Thanks to patented NG Green Technology, we were able to achieve these goals, which at first glance seemed contradictory, in an impressive manner. The core piece of the visionary technology is the completely new centrifugal wheel design. Its blades are not rigid as usual, but flexibly mounted and fold forward independently depending on their position. This allows them to accelerate the blower wheel at every turn without external force – similar to a four-arm hydraulic float. This optimal use of physical processes has enabled NG Green to solve a well-known problem of conventional milling for the first time. The reason why these machines are so inefficient is that the rigid blades push the bulk material directly into the inner walls of the centrifugal chamber. This results in friction, which requires a great deal of energy. In contrast, the milling machine uses the energy supplied to it extremely efficiently, which is reflected in a material throughput that is up to 60 % higher with the same energy input. “Of course, we were already aware of the potential of our technology when our company was founded in August 2015. But it was always clear to us that this alone was not enough for marketing,” emphasizes Leopold Gansch. In order to create the necessary conditions for a successful market entry, he therefore wanted to have the functional principle of the milling unit investigated by an independent party. He found competent partners in the experts at LCM. “We see ourselves as the interface between research and business,” emphasizes LCM Managing Director Gerald Schatz. “It was therefore an exciting challenge for us to scientifically verify a previously unknown technology and in this way make a contribution to its series production readiness. The LCM team led by project manager Markus Schörgenhumer used the HOTINT software developed in-house for this purpose. The provided data and plans were mapped in a complex multi-body simulation model. In a multi-stage research process, the effectiveness of the investigated functional principle was qualitatively confirmed. Parallel to the mapping of the actual state, the LCM experts also turned a wide variety of adjusting screws of the system during the modeling process. “This has made it possible to identify interesting perspectives for further optimization of the milling unit,” says Gerald Schatz, commenting on the results of his team. The millinginator already impresses not only with its energy efficiency and high performance, but also with undreamt-of application possibilities. 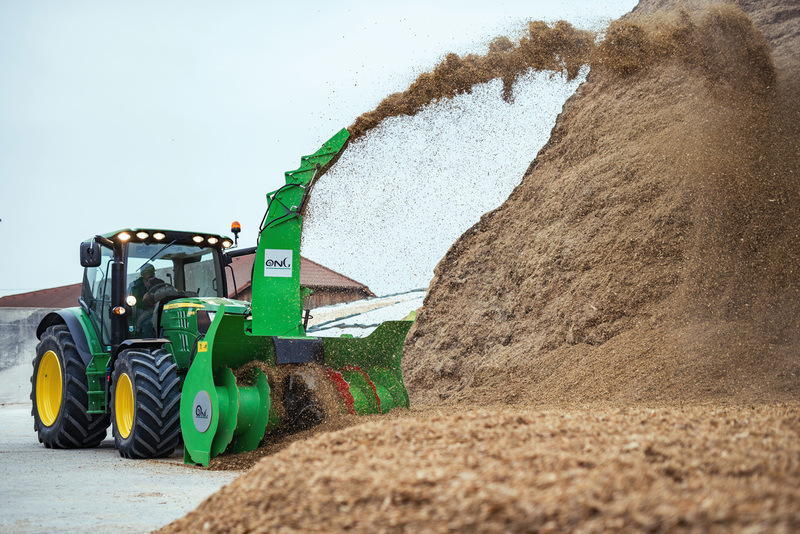 Not only can it cut snow, but it can also fill all kinds of bulk material such as wood chips, feed, sand and even grain. “When it comes to the rapid and gentle movement of bulk material, the milling machine is the measure of all things,” says Leopold Gansch proudly. “It can be used almost anywhere and can easily be mounted on all common carrier vehicles such as tractors or Unimogs”. The ejection capacity is 3,000 to 5,000 m3/h, depending on the type of bulk material. The working speed can be freely selected between 2 and 15 km/h. The discharge capacity can be adjusted to suit the type of bulk material.